Flavescent sophora root (Kushen)-Sophora flavescens Ait. Botanical Name: Sophora flavescens Ait. Part Used & Method for Pharmaceutical Preparations: The roots are dug in spring or autumn. After the fibrous roots have been removed, the roots are cleaned, cut into slices and dried in the sun. 1. Damp-heat syndrome: a) damp-heat jaundiceFlavescent sophora root (Kushen) is used with Phellodendron bark (Huangbai), Capejasmine (Zhizi), Chinese gentian (Longdancao) and Oriental wormwood (Yinchenhao); b) damp-heat diarrhea and dysenteryFlavescent sophora root (Kushen) is used with Costus root (Muxiang) and Licorice root (Gancao); c) damp-heat leukorrhea and eczema of the genitalsFlavescent sophora root (Kushen) is used with Phellodendron bark (Huangbai), Cnidium fruit (Shechuangzi) and Chinese gentian (Longdancao). 2. Skin diseases, including itching of the skin, scabies and impetigo. 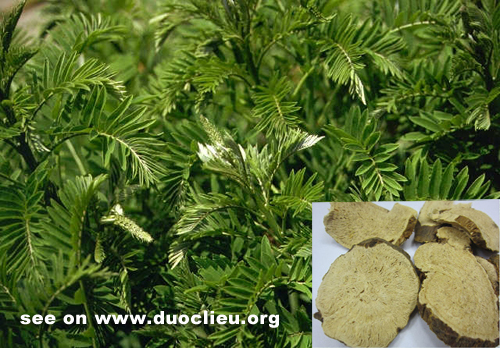 Flavescent sophora root (Kushen) can be used internally and externally. The herb is combined with Chinese angelica root (Danggui), Dittany bark (Baixianpi), Broom cypress fruit (Difuzi) and Red peony (Chishao). 3. Painful urination caused by damp-heat. Flavescent sophora root (Kushen) is used with Dandelion herb (Pugongying) and Pyrrosia leaf (Shiwei). Cautions & Contraindications: This herb should never be used with the herb Black false bellebore (Lilu). It is contraindicated in cases with weakness and cold in the spleen and stomach.